9 delicious Kangaroo Meatballs, (approx 330g) packed and sealed in a tray. 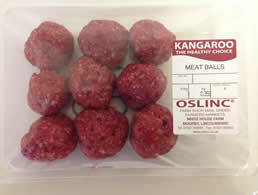 Kangaroo meat is one of the healthiest meats available today. Its extremely low in fat and high in protein. Our homemade kangaroo meatballs are a real treat. Rich with a slight game flavour perfect with pasta, potatoes or grains.